I’ll get to my favorite reads of the week in just a bit, but first, indulge me for a moment. It will make you feel good, promise. 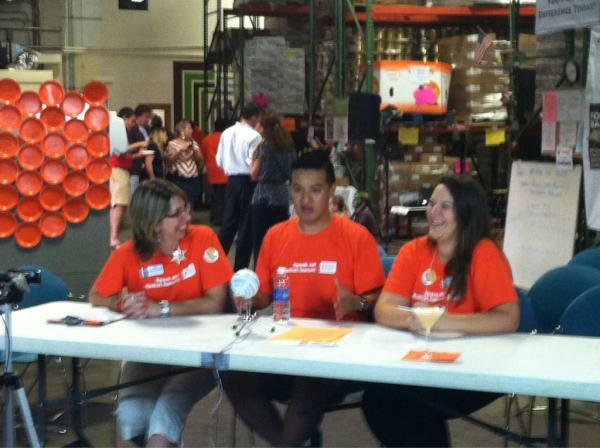 The Food Bank of Central & Eastern North Carolina held their first 24-hour fundraising telethon (#foodbank24). They hosted a live video stream on their website and all kinds of fun events at the warehouse. As you can see by their tweet, the telethon was a huge success. How cool is that! My heroes of the week are Gregory Ng, telethon talent aka frozen food master Freezer Burns, and Mike Adams, telethon producer aka the man behind the curtain with 5-hour energy can in hand. I have huge admiration and respect for these two guys who gave up any semblance of a normal life for well over 24 hours to help out the Food Bank. Deep bow. What else have I been digging lately? Will Burns’ Ideasicle podcasts, that’s what. Will explores ideation and creativity in his interviews with a fascinating mix of creative types. I’ve been listening to these on my exercise walks – very inspiring. And look, a social media case study! Don’t yawn, this one features a small company that, without even intending to use social media, ended up having great success despite themselves. Andre Bourque uncovers the story at VentureBeat: How Pinterest & a Single Blog Post Completely Changed a Company. Who else is tired of hearing self-righteous political rants 24/7? I see a lot of hands out there. Don’t get me wrong, I find politics fascinating. And I vote in every election, so there, my bona fides. But I’m tired of seeing political tweets and Facebook updates with a “we’re so much better and smarter than the other side” smugness and disdain. I get that you’re passionate, but the world is not black and white, yes, there really are many shades of gray. Your passion is tiresome. Partisan scorn, no matter what side it comes from, is loathsome. I wonder if Tara Hunt would agree. Last week she shared: 5 Things I’ve Learned By Listening to People Whose Views Differ. Her first lesson: “Just because someone doesn’t agree with you or thinks in a manner that opposes your views doesn’t mean he or she is uneducated or idiotic.” I only wish our politicians felt the same way. And along those lines, here’s what happens when that mindset goes over the edge into the scary extreme. The New Yorker ran a powerful excerpt from Salman Rushdie’s forthcoming book: The Disappeared: How the Fatwa Changed a Life. I’ve only read one book by Rushdie – Midnight’s Children – and what a book it was, I highly recommend it. Have any of you read Satanic Verses? This week I also became a huge fan of Emily Dickinson. And by the time the weekend’s over, I expect to be raving about Walt Whitman too. I’m taking a modern and contemporary poetry class from Coursera. I’m curious to see how effective and enjoyable a MOOC is – that’s a massive online open course. Plus I’m eager to give my creative muscle a poetic work out.